August 8th, 2014 - Is your 5,000lb forklift really lifting 5,000lbs safely? You just purchased a new forklift. Along with your purchase you made sure your forklift operators were trained properly. One of the key components of training is understanding of a forklift’s capacity and how that capacity can change depending on alterations or wear and tear on the lift truck. Operators’ knowledge of safe lifting capacity equals a lower risk of property damage, injury or death. Your forklift was shipped from the manufacturer with a data plate indicating lift capacities at various heights based on its equipment options. For example, side shifters, carton clamps or other attachments. The following information will help you minimize the risk of exceeding your equipment’s capacity and avoiding possible accidents resulting in expensive downtime and injury. Forks – The continual use of forklifts results in normal fork wear. The amount and rate at which they wear depends upon the weight of the loads handled, how they are handled (what type of substrate is coming in contact with the fork) and how often loads are handled (duty cycles). A 10% reduction in fork surface (wear) results in a 20% reduction in the safe lifting capacity of your forklift. 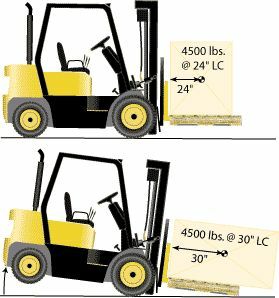 A forklift rated to lift 5,000lbs is reduced to 4,000lb once the forks are 10% worn. At this point the forks must be replaced. Daily Inspectionsare required by OSHA. While a daily measurement of fork wear is not required, it is good practice to conduct a fork wear inspection on a regular basis, based on previous “FORK” criteria previously mentioned. During daily inspections, forks should be visually inspected for cracks or bends. Both reduce the safe lifting capacity of your forklift and create a dangerous operating condition. If the load you are carrying changes requiring a need to use longer forks, the load center changes. This results in a reduction of safe lifting capacity. It will be important that you work with the manufacturer to determine the new safe lifting capacity of your forklift with the new fork configuration. Chains – Chains should be inspected as part of any normal Planned Maintenance Program. Your service technicians should be properly trained to measure chains to determine when they need to be replaced. When a 3% elongation results in a 15% reduction in safe lifting capacity the chains should be replaced. Never attempt repairs on chains that are worn. Replacing them with the proper chains per manufacturer’s specifications is recommended to ensure a safe working environment for your employees. Load Center – The data plate on your forklift indicates safe load capacities at given fork load centers. Not every pallet received by your facility is loaded according to the forklift manufactures specifications. It is important for safe operation to recognize and adjust your lifting practices to ensure safe handling of materials. As a rule, for every inch beyond the manufacturers recommended fork load center, one hundred pounds of lifting capacity is lost at a lowered height of six to eight inches. Tires - Verify they meet manufacturer’s specifications. Especially if changing the type (cushion or pneumatic) or the size. Batteries - Verify they meet manufacturer’s specifications. If you have purchased a used forklift this can be an issue. Seek assistance from a professional that you are equipping it with the proper battery. Attachments - Anytime you add an attachment of any kind, regardless of how benign it may seem, work with a professional or the manufacturer to determine if the attachment affects safe lifting capacity – if so, how much. Engines - You might never replace an engine. But if you do, be certain the replacement engine meets or exceeds the weight of the current engine and that the configuration of the replacement engine does not affect the center of gravity of the forklift. This is particularly important if you purchase used forklifts. Ask the seller if the engine has been replaced or altered in any dramatic fashion. If it has, be sure the forklift has been re-rated for safe lifting capacity. There are sites on the Internet like http://www.lifttruckcapacitycalculator.com/ that can assist you in re-rating your forklifts after minor changes such as attachments or other alterations that may affect their safe lifting capacity. Working with a partner to institute and manage a Planned Maintenance Program is the best way to guarantee that your forklift fleet is always operating safely and your employees are not in danger. Planned Maintenance Programs have also been proven to be the best way to maximize the productivity of your forklift fleet by reducing down-time. These programs will pay for themselves over and over again throughout the life of your forklifts. If you have any questions about forklift de-rating, or want to be sure your forklift fleet is safely rated, please contact us. We will be glad to help. Call us at (888) 550-6836 or submit your request below!